Valve is well-known for their community support - which other company not only provides an online FPS game with updates for 5 years, offers modding support and a platform for sharing user-created content (Steam Workshop) and sometimes even includes said items into the game itself (Polycount Items)? Soon players will be able to voice their opinion on something even bigger - the choice of whether a game should be released on Steam or not. Steam Greenlight is a voting system currently in the works that will allow each user with a Steam account to vote for a game that is currently in the validation process. Not the total number of votes will count, however, but rather the number of votes relative to to the number of votes given to other games. Basically, the more demand there exist for a game, the more likely it is for Steam management to think of the game as a profitable investment to offer it in the store. We're going to be reaching out to developers as we see their games getting traction regardless of whether they have achieved a specific number of votes or are sitting 1st or 2nd place at any given time. We are most interested in finding the games that people want, not requiring them to always hit a specific number of votes. This system is especially promising for Indie games. Since Steam has become the de facto No.1 selling platform for those (see Super Meat Boy and Cthulhu Saves the World for example), competition is fierce and not everyone can make the jump. This voting system should further help to separate the wheat from the chaff. The voting system isn't just for players, however. Developers can put in their games into Greenlight themselves. It doesn't even need to be a complete game, a game currently in progress can be published in the "concept" category which allows for early feedback and building up a community for it on Steam. In a way, this system is similar to Kickstarter: If enough people consider the game worthwhile, financial aid (Kickstarter) or a publishing deal (Greenlight) might be possible. 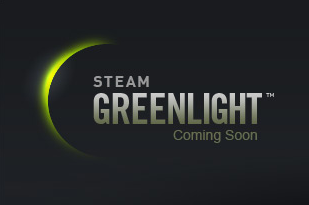 Greenlight is slated to be released to the public at the end of August this year.